Below, you'll find all the hotels near Carrow Road. All the hotels are listed by their distance to Carrow Road Stadium itself. From the South: Take the A11 or A140 coming off onto the A47 towards Great Yarmouth and Lowestoft. Take the A146 Norwich/Lowestoft slip road, turn left towards Norwich & follow signs for Football Ground. From the West: Take the A47 to the A146 Norwich/Lowestoft slip road, take a left turn towards Norwich & follow signs for Football Ground. It's a 5-10 minute walk from the train station and a 10-15 minute walk from Norwich. 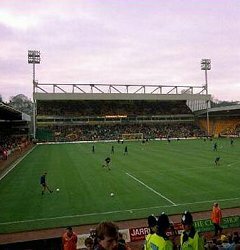 Do you need help finding a hotel near Carrow Road? Chat to us live for free. A cosy hotel based in the centre of Norwich. Conveniently situated in Norwich centre opposite the Norman cathedral. A new boutique hotel situated within a fabulously restored building. Situated in its own grounds with ample car parking. Set in its own grounds on the outskirts of the medieval City of Norwich. Fully furnished apartments are available for long or short stays. Hotel in the city centre, close to the Norfolk Broads and countryside. Only a few minutes walk from the city centre of Norwich. Just a short walk away from the fine city centre of Norwich. Close to the main A47 road and less than three miles from the city centre. The hotel is located on the popular site of the Norwich Sport Village. A modern hotel located between the airport and the city centre. A family pub, restaurant and inn that is less than 15 minutes to Norwich. Located just 50 metres from Norwich International Airport. Surrounded by tranquil wooded parkland and its own golf course. A lovely modern hotel situated on the outskirts of Norwich. Situated in the Heart of the Norfolk Broads and overlooking the River Bure. Situated just off the B1113 between Wymondham and Long Stratton. Set in 250 acres of beautiful Norfolk countryside, just 10 miles from Norwich. Situated in the ancient market town of Reepham. The former Rectory is now a charming family run country hotel. All pages within the StadiumHotels.com & StadiumHotels.co.uk websites are Copyright © 2002-08 HotelsForEurope.com. All rights reserved. If you wish to reproduce any content please contact us first for permission - We don't bite!